Munich - It is a record that has stood for 43 years, but it would appear Gerd Müller's single-season haul of 40 Bundesliga goals is under serious threat in 2015/16. Leading the charge with ten goals in seven games so far this term, FC Bayern München striker Robert Lewandowski's astounding double-digit return only narrowly shades that of Borussia Dortmund forward Pierre-Emerick Aubameyang, who took his own tally to nine with a brace against SV Darmstadt 98 on Matchday 7. 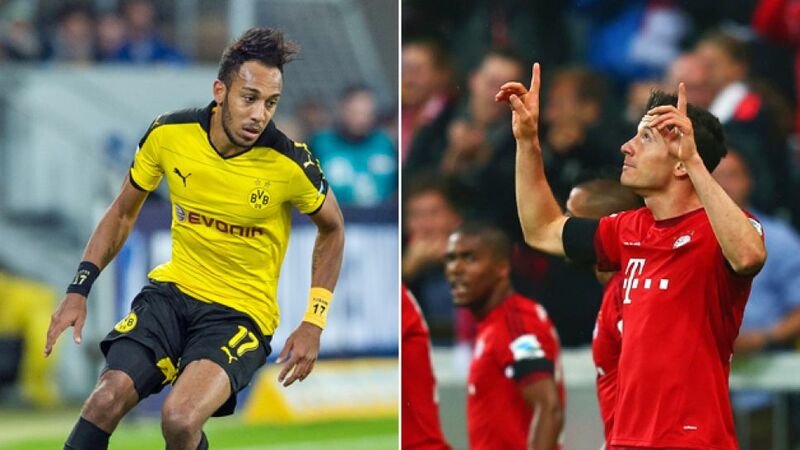 In true Texas shoot-out style, the in-form goal-getters face off this weekend as league leaders Bayern host second-in-the-table BVB in Der Klassiker. "He's a goal machine," said Dortmund captain Mats Hummels of his former Schwarz-Gelben team-mate Lewandowski. "You can enjoy his goals, even as part of BVB. I had an incredible smile on my face when he scored his five goals. He's just an exceptional striker." As Hummels touched on, Lewandowski underlined his credentials as one of world football's most polished strikers by netting every single goal in Bayern’s 5-1 victory over VfL Wolfsburg on Matchday 6. In the process, the 27-year-old Poland international smashed a whole host of Bundesliga records from most goals scored by a substitute to fastest hat-trick, four-goal salvo and quintuple. As if scoring five times in nine blistering second-half minutes was not enough, the 27-year-old wrote his name into the history books yet again against 1. FSV Mainz 05 on Matchday 7 by becoming the Bundesliga's fastest non-German player to reach 100 goals - on his 168th appearance. To put that incredible achievement into context, only six players have hit the century mark for goals in a shorter space of time in 52 years of the Bundesliga, chief among them the aforementioned Müller. Der Bomber was also the only player to find the net ten times in the first seven Bundesliga matches of a season (in 1968/69 and 1977/78), until the indomitable Lewandowski matched that feat with his second of the afternoon at the Coface Arena. "We'll see how many goals I end up scoring," the ex-Dortmund hero smiled after helping the Bundesliga leaders to their seventh successive league win of 2015/16. It goes without saying Lewandowski is enjoying his best spell in a Bayern shirt since leaving BVB in summer 2014 (he scored 17 goals in 31 Bundesliga appearances in his first season at the club), but he is not alone at the top of the 2015/16 scorers charts. On target at least once in all seven of his Bundesliga outings so far this season - a Bundesliga record in its own right - Dortmund's Aubameyang has evolved into one of the German game's most complete strikers. The signs were there when the Gabon international finished his second campaign in Dortmund colours with an impressive 16 Bundesliga goals to his name, 12 of which came from his favoured centre-forward position. It is only in recent months, however, that the 26-year-old has truly began to resemble the man who famously fired Dortmund to a domestic double in 2011/12. "He's on fire," said Dortmund head coach Thomas Tuchel of Aubameyang, only the second player in the club’s decorated 105-year history after Lothar Emmerich (1965/66) to have nine goals to show for the first seven matches of a Bundesliga season. "He's unstoppable right now." While Aubameyang failed to hit the 20-goal-mark in either of his previous two Bundesliga campaigns - unlike Lewandowski, who did so for the third time in his final year as a Dortmund player in 2013/14 - on current form, he is set to blow it out of the water. Mathematically speaking, were the AC Milan youth product to continue scoring at his current rate of 1.29 per game between now and May, he would finish 2015/16 on 43 goals. 'Legendowski', meanwhile, could even reach 48 (1.42 goals per game). Fitness and form are the obvious caveats for both men, but for now there seems to be no reason whatsoever why this season’s leading marksmen cannot sustain their seemingly ceaseless march to Müller's throne in an already multiple-record-breaking Bundesliga campaign. What better stage to do so than in Der Klassiker.